What’s the Future of Bladensburg Road? This is just a first step in the long-term planning process. Community input is essential throughout the process. Please direct any comments on the presentation or questions regarding the development strategy to Derrick at dlwllc.advisory@gmail.com. In the meantime, expect to see more activity at the Starburst Plaza (where H St, Florida Ave, Benning Road and Bladensburg Road intersect). HSMS is planning for a farmers’ market, concerts and other activities this summer. The Department of Health is holding their annual Animal Health Fairs, offering free vaccinations for your cats and dogs. DOH will be in Ward 5 at the Charles Young School, corner of 26th & H Streets NE on Saturday May 30th from 9:00am to 11:30am. Residents are not limited to attend the fair in the ward they reside in — see below for a full schedule of dates, times and locations. Please make sure your dogs are on leashes and your cats are in secure carriers. 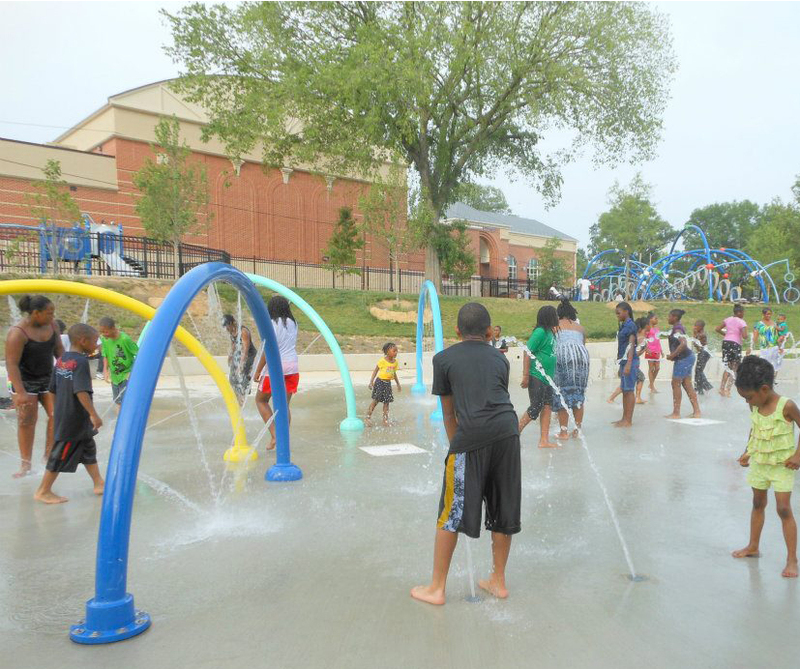 DPR kicks off summer this Saturday by opening all outdoor pools and spray parks, including the spray park at the Joe Cole Park. The water will be on from 10am to 7pm on weekends, then daily starting June 22nd. Take pride in Trinidad! 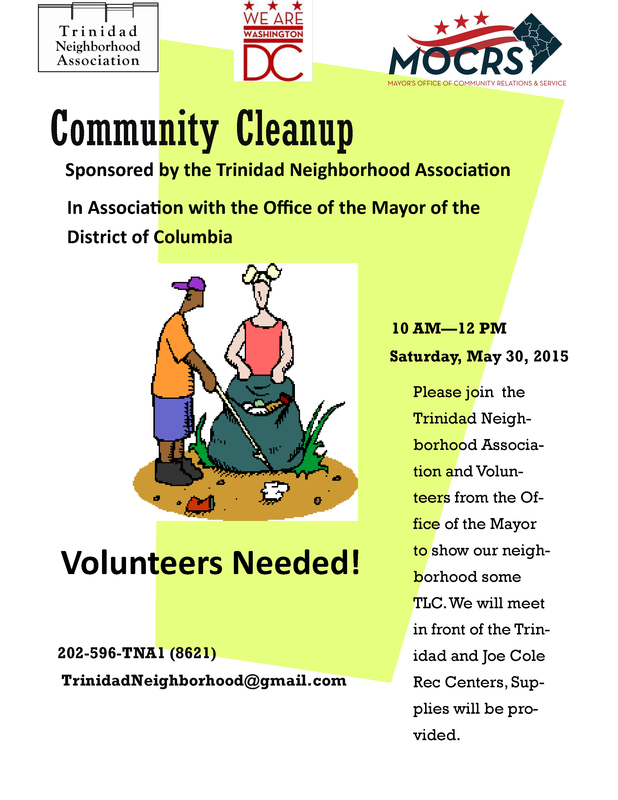 Join your neighbors in a community-wide clean up. The clean up will happen throughout the neighborhood. What areas should the clean up focus on? Where is there a lot of litter? Please leave your suggestions in the comments below. Sponsored by TNA and the Office of the Mayor. A big thanks to the Mayor’s Ward 5 community engagement team, Tommie and Malik! ASL/English Interpreting provided by Access Interpreting. The Bodega Market has applied to the Alcoholic Beverage Regulation Administration (ABRA) for a substantial change to its license, from a Class B to a Class A. That means it would expand to sell spirits as well as the beer and wine already offered in the store. The Bodega has reportedly purchased the liquor license from Brothers Liquor, which earlier this year closed their store located next to the Bodega. Expect the owners to come before the ANC to ask for community support. The ANC can vote to support or protest the application. ABRA also enables residents to protest a liquor license application: How To File a Protest. Per DC Code § 1–309.11.3.c and ANC 5D Bylaws § V.4, Commissioners Blacknell, Buggs, Lee, Roberts and Shropshire have requested a Special Meeting of ANC 5D to address the below agenda items. Per the bylaws, only the below items may be discussed at this Special Meeting. Inspired by the Trinidad Neighborhood Garden Tour? Wish you had spring blooms in your garden? 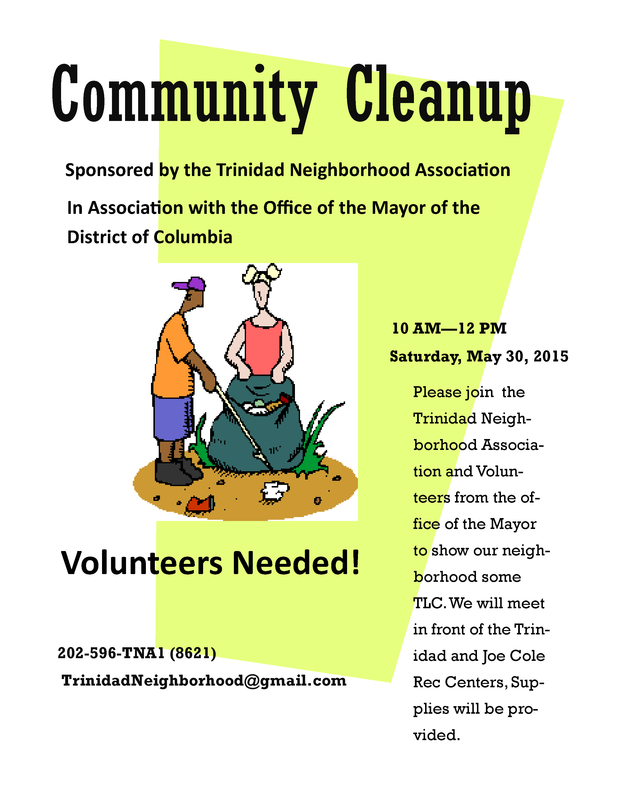 Make that dream come true while supporting TNA’s neighborhood beautification efforts. Our annual Flower Power fundraiser offers a selection of bulbs that will be shipped directly to your door at the ideal planting time. For every purchase you make, Flower Power gives 50% back to TNA. Click Here to Shop! While you are waiting for your bulbs, check out The Summer Garden Workshop Series being offered by the Department of Parks and Recreation. Mondays, Wednesdays and Saturdays through September. Workshops are free but registration is required.